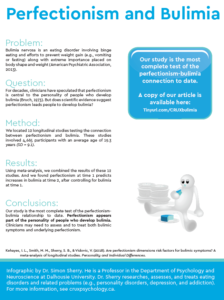 Bulimia nervosa is a common and a life-threatening eating disorder. 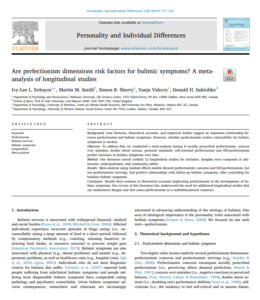 About 275,000 Canadian females will have bulimia nervosa at some point in their life (Hudson et al., 2007). At least 80 per cent of people with bulimia nervosa are female. 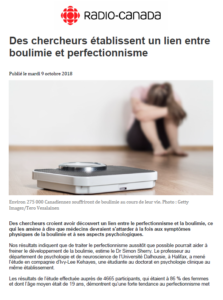 Bulimia nervosa typically onsets between age 16 and 20 and lasts for more than eight years before symptoms remit (van Son et al., 2006). Since bulimia nervosa is widespread and destructive, uncovering factors that lead to this eating disorder is important. 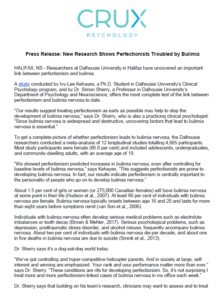 Dr. Simon Sherry’s research team just published a comprehensive study investigating the relationship between perfectionism and bulimia nervosa. 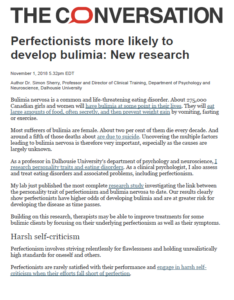 This research shows perfectionists are at greater risk for developing bulimia nervosa as time passes.